Opinion: By David Skolnick | May 18, 2018 at 12:00a.m. As I sat and listened to the arguments and the comments of a three-member panel of the 8th District Court of Appeals, it became apparent that the judges had concerns about Cuyahoga County being the proper venue for the trial of Atty. Martin Yavorcik. At several points during the hearing, the judges – particularly Kathleen Ann Keough, a Youngstown State University graduate – interrupted Dan Kasaris, senior assistant attorney general, and Matthew E. Meyer, Cuyahoga County assistant prosecutor, to ask about the location of the trial. Why wasn’t the case heard in Mahoning County, “where everything happened,” rather than Cuyahoga County? Judge Keough asked. The two prosecutors said Mahoning County has a longstanding reputation for public corruption, and they proved to the judge in the case, Janet R. Burnside, and a jury during Yavorcik’s Oakhill Renaissance Place corruption trial that there was a connection to Cuyahoga County through a Cleveland law firm. “Mahoning County [has a] rich history of corruption, and people in Mahoning County sell their offices,” Meyer said. “Corruption is essentially a minor offense” there. This happened March 28, 2017. David Doughten, Yavorcik’s attorney, said after the hearing that he expected a decision in two to four weeks. But it wasn’t until May 10 of this year – well over a year – that the court vacated the eight felony convictions against Yavorcik after determining Cuyahoga County was the wrong place to conduct the trial. Pardon the pun, but it’s almost criminal that the court would take more than 13 months to come to a unanimous decision. If there was a dispute I could see a delay, but even then it shouldn’t have taken this long. Yavorcik, a failed 2008 independent Mahoning County prosecutor candidate, was found guilty March 25, 2016, of eight felonies: one count each of engaging in a pattern of corrupt activity, conspiracy and tampering with records, two counts of money laundering and three counts of bribery. He was sentenced by Judge Burnside on April 22, 2016, to five years’ probation, including the first year on house arrest – which he served 11 months and was released from serving the final month because he did so without violation. Also, his law license was suspended for five years, he was required to undergo alcohol-abuse treatment – which was terminated June 1, 2017 – and ordered to serve 200 hours of community service. Judge Burnside was ordered to vacate the judgment. She is holding off on doing so and gave prosecutors until June 24 to file an appeal with the Ohio Supreme Court. The attorney general’s office is still reviewing the court ruling and determining if it will appeal to the Supreme Court. But it’s hard to imagine that with all of the time and money invested by prosecutors that they’ll just simply let this one go. In hindsight, prosecutors should have probably had the Oakhill corruption investigation – which also snared former Youngstown Mayor John A. McNally and ex-Mahoning County Auditor Michael V. Sciortino, who took plea deals and were sentenced to probation – in Mahoning County. Judges here would have quickly recused themselves and a visiting judge would have been assigned. That visiting judge would have likely imposed harsher sentences on Yavorcik and Sciortino – and possibly Mc-Nally – than Judge Burnside. If the case is appealed to the Supreme Court, Doughten said he believes his side will win. Prosecutors alleged a conspiracy started in 2006 to impede the move of Mahoning County’s Department of Job and Family Services from a Cafaro Co. subsidiary-owned property on Youngstown’s East Side to the county-owned Oakhill Renaissance Place, the former Forum Health Southside Medical Center on the South Side. Prosecutors say Yavorcik joined the conspiracy in 2008 when he ran for prosecutor. 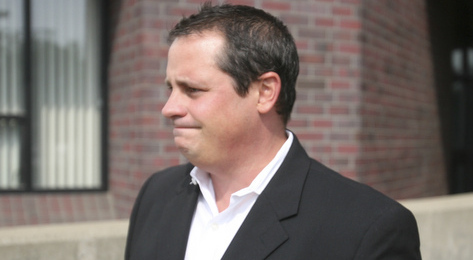 The jury convicted Yavorcik of illegally taking about $140,000 in bribes to kill the Oakhill probe if he were elected. He lost that election by 38 percentage points to incumbent Democrat Paul J. Gains. September 24, 2016 12:02 a.m.